SGMiner-GM is a revitalization of the sgminer project (source), brought to you by Genesis Mining and being developed and maintained by Philipp Otterbein, OhGodAGirl and Wolf. The latest version sgminer-gm-5.5.5 comes with support for ETH, XMR and Zcash and NiceHash has also just released a fork with support for their services for using the miner for selling your hashrate on their service for Ethereum and Monero. The recently added support for Zcash mining using sgminer-gm relies on the Zawawa’s Gateless Gate implementation, so it is not very competitive as compared to other faster solutions at the moment. 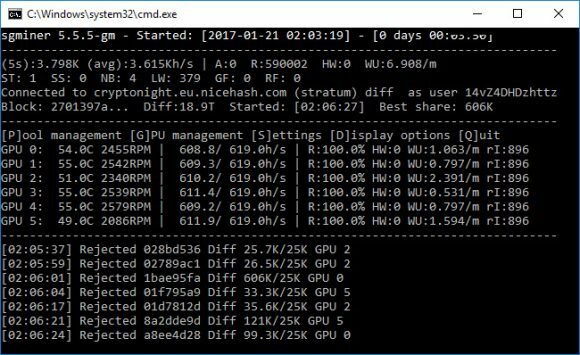 Similar to the Zcash implementation not being the fastest out there, there are also other algorithms supported by the SGMiner-GM project that may not be the best performing for the moment hashrate-wise. You can however try mining Monero (XMR) with this release of the sgminer-gm as opposed to other alternative miners as it seems to be performing very competitively hashrate wise as well as in terms of power usage. 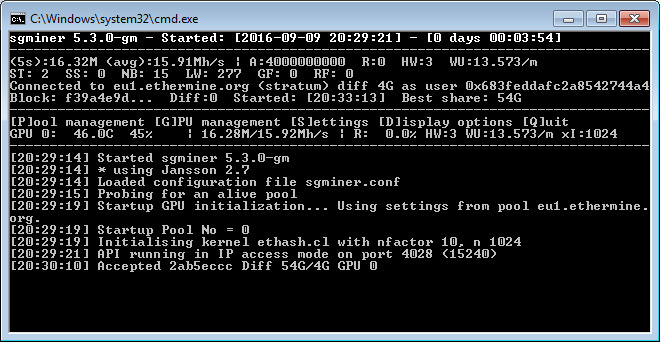 Below you can find a Windows binary of the latest xgminer-gm 5.5.5 release ready for you to try out if you want to check it out. It is the official sgminer-gm and not the fork with NiceHash support, so if you want to use NiceHash’s services use the link above to download their fork. Today, Genesis Mining announced the release of sgminer-gm – an AMD GPU miner with support for the Ethereum network. Developed in cooperation with Wolf0, sgminer-gm incorporates the best of cgminer and sgminer in one easy-to-use package, and adds a long-awaited feature: stratum support for Ethereum (ETH), though you will be able to use the miner for other crypto currencies using the Ethash algorithm as well. All other Ethereum miners so far were custom and not based on the cgminer/sgminer functionality and now you will be able to work with the familiar feature set that sgminer comes with, including the API available for integrating support in other software for monitoring of your mining rigs for example. Sgminer-gm can be compiled from the official Github repository (source); Windows executables are available for 32-bit and 64-bit operating systems; and a compiled Ubuntu binary. A sample configuration is provided for users, just make sure you set the mining pool and wallet/worker address in the sgminer.conf file before running the miner! Feel free to give the miner a try and then also report if you are having any trouble running it or what hashrate are you getting mining Ethereum and on what AMD GPUs. Founded in 2013, Hong-Kong based Genesis Mining has become a world leader in providing hosted hashpower for cryptocurrency. In November 2015, a nationwide awareness campaign was launched in San Francisco, Chicago, Miami and LA by Genesis Mining, which highlighted the benefits of using Bitcoin. In March 2016, the company launched the Logos Fund: a private fund dedicated to investing into a wide range of Bitcoin-related businesses.